After a long day at the beach, exploring the island, or simpy lazing around by the pool, treat your mind and body to a relaxing session at The Spa. Designed with a sensual Asian aesthetic, Charming lily ponds, and shooting streams foster relaxation and rejuvenation. 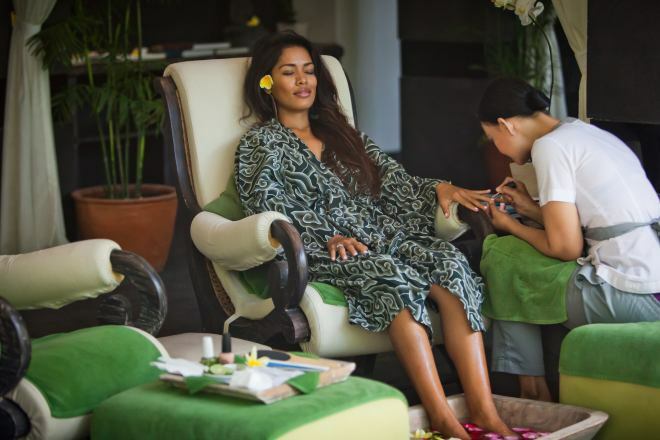 Choose from an indulgent variety of authentic Balinese treatments using hand-made botanical cream, scrubs and masks. Contemporary manicures and pedicures offers the lates hues from Revlon and OPI. The Spa offers guests a refresing timeout, delicate beautification, and indefinitely, a calm to be remembered.